The nose of the BMW 118d coupé comprises the classic BMW kidney grille in the middle, flanked by striking-looking twin headlights with eye-like corners. The BMW 118d coupé comes in a range of paint finishes, both metallic and non-metallic. The three basic non-metallic exteriors are classic red, black and white, which makes the BMW 118d coupé a good addition to a company fleet (and certainly one with style! ), as adding logos is easy to do on these backgrounds. The overall look is muscular and sporty, but not in a threatening or ostentatious way – the sportiness never becomes vulgar or over-the-top. The fog lights that come as standard also look pretty snazzy. The BMW 118d coupé shares the 2.0 litre (just to be confusing) 4-cylinder common-rail diesel engine with the other 118d options. This engine delivers 105 kW punch max at 4000 rpm, and sees the torque peak curving at 3000 rpm when the needle sits in the 1750–2500 rpm range. The BMW 118d coupé can get from 0–100 kmh in 9.0 seconds (in the six speed manual version; the six-speed automatic does it in a fraction of a racing heartbeat slower at 9.1 seconds) and has a top speed of 209 kmh. The fuel economy stats in the BMW 118d coupe ain’t bad for such a nippy little car, with a combined figure of 4.5 l/100 km for the manual (5.4 for the auto). On the inside, the BMW 118d coupé is never going to be the perfect choice as the main car for a family with children over the age of five. (You’d be better off to consider a 3-series. Make that a 5-series if you have teenagers.) However, this would make a good choice as a second family car, as the drive for a young couple or single, or as a very respectable and stylish “grandma car” – which isn’t meant as an insult to the BMW 118 D Coupe in the slightest. Thelma and Louise would have loved this car! However, the driver and front passenger have plenty of head, shoulder and elbow room as they sit on the very comfortable seats trimmed either in fabric, fabric and leather blend or else straight leather. Safety inside the BMW 118d Coupé is superb. The brakes have not only been fitted with BMW’s innovative brake energy regeneration function, but the 118d is also able to detect when you’re slamming on the brakes hard and fast, and will warn the drivers behind of this with the Brake Force Display lights that shine more brightly when the brakes go on hard. The Active Steering is speed-sensitive and automatically countersteers if a skid is likely when braking or cornering. The rear-wheel drive also allows the BMW 118d Coupé to steer with precision and grip, as well as making for plenty of power and performance. Even the multi-link rear suspension has been tailored to maximise grip and stability as well as ride comfort and responsiveness. 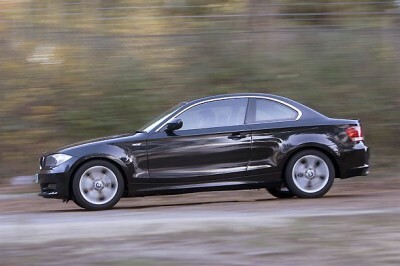 Dynamic Stability Control comes as standard in the BMW 118d. Other standard safety features include pretensioned seat belts and head/thorax airbags. In summary, the BMW 118d Coupe is a Smart, stylish city car that drivers throughout Australia will be proud to own. For any more information on the BMW 118d coupé, or for that matter any other new car, contact one of our friendly consultants on 1300 303 181. If you’d like some fleet discount pricing (yes even for private buyers! ), we can submit vehicle quote requests out to our national network of BMW dealers and come back with pricing within 24 hours. Private Fleet – car buying made easy!